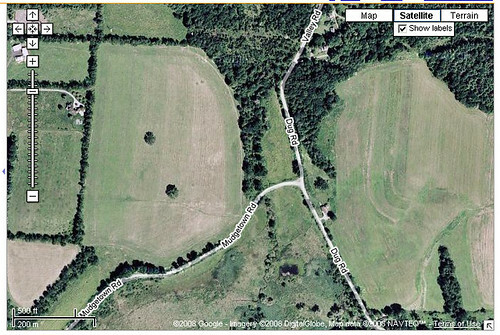 twin oaks field via satellite, originally uploaded by jahansell. Just when I thought I'd shown every possible view of the Twin Oaks field, I thought of another one! Last time I looked at Google satellite view of Sharon, it was very rough - they didn't have as fine-grained resolution for this area as many others. But now it's all there (though my house is so shaded by trees you can't see it.) I always wonder how often these are updated - this is green and summery looking (and clearly taken in mid-day, based on the narrow shadows cast by the trees, which you could see if you went to the closest-range view.) To get this view, go to google maps and type in "Dug Road, Sharon CT 06069" and you can look around!